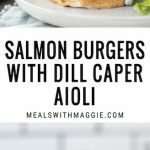 Juicy, filling and packed with protein and healthy fats, these salmon burgers with dill caper aioli will satisfy your cravings. Don’t ask me why I decided to post about salmon burgers in the middle of fall, but when aren’t salmon burgers a good idea? I’ve been really into aioli lately and I have never been a hamburger person, so these burgers were the tasty solution. I know It’s not close to salmon season yet. Normally I buy salmon from Costco, use half of it that week and then freeze the other half for another time. It’s shocking how fast my husband and I go through salmon. Sometimes I think about what our grocery bill will be when we have kids, no wonder why my mom never let me have gushers. Anyways, this week is all about salmon burgers! Let me just start by saying that the ones I photographed for this post I made for my brother, Walter. It was the hardest thing giving these to him. Granted he pays me each week to make his dinners, but this time it was difficult parting with these juicy little gems. 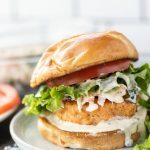 These salmon burgers were adapted from this recipe, which I have made countless times. I am in love with the way these photos turned out and I’ve got to give it up for the brioche bun. Toasted and perfectly soft, it really hugged these salmon burgers in the best way possible. If you are patient, toast your bun in a sauté pan on low-medium heat or turn on your broiler, but make sure you don’t burn it! Tastes great and is made with 4 ingredients! The aioli is a healthier version made up of capers, dill, lemon juice and avocado mayo. There are several brands of avocado mayo, but Sir Kensington’s was at Costco and they have a vegan mayo that I’ve been wanting to try. 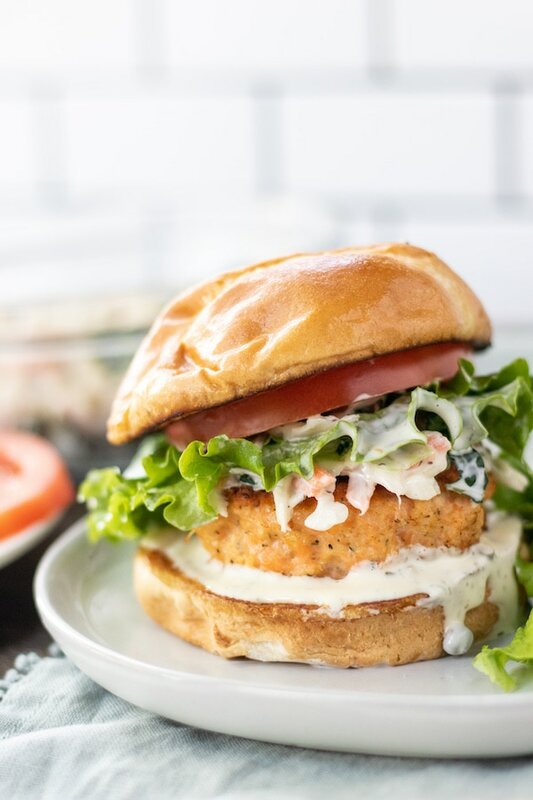 These salmon burgers are filling! Stuffed with heart healthy fats from the salmon and avocado mayo, you can’t go wrong. I spoke more about the health benefits of salmon in this post if you wanted to know why it has heart healthy benefits. Lately, I was rethinking providing nutritional facts in my posts, so I took an instagram poll to see if you guys enjoy seeing them and most have said yes! The internet can sometimes perpetuate disordered eating and have people hung up on the numbers or think that something has “too much fat” or “too many calories.” I used to be this way and I don’t want to be part of the problem. More readers wanted it than not, so I will include them for now. That being said, the nutrition for each patty is linked below the recipe. Begin to prepare the salmon burgers by adding salmon, eggs, onion powder, garlic powder, salt and pepper, breadcrumbs, dill and lemon zest to a food processor and process until throughly mixed. Remove salmon mixture from food processor and form into 8 rounded patties. Refrigerate for 10-15 minutes. Place salmon burgers on sheet pan and bake until inside cooked through. This should take about 15 minutes. While the burgers are cooking, prepare the aioli by whisking together ingredients in a small bowl. Prepare kale slaw by combining avocado mayo, yogurt, lemon juice, mustard and celery seed in the bottom of a large bowl. Pour cabbage and kale mixture on top and mix to combine. Place in refrigerator, covered for 5-10 minutes to let flavors muddle. 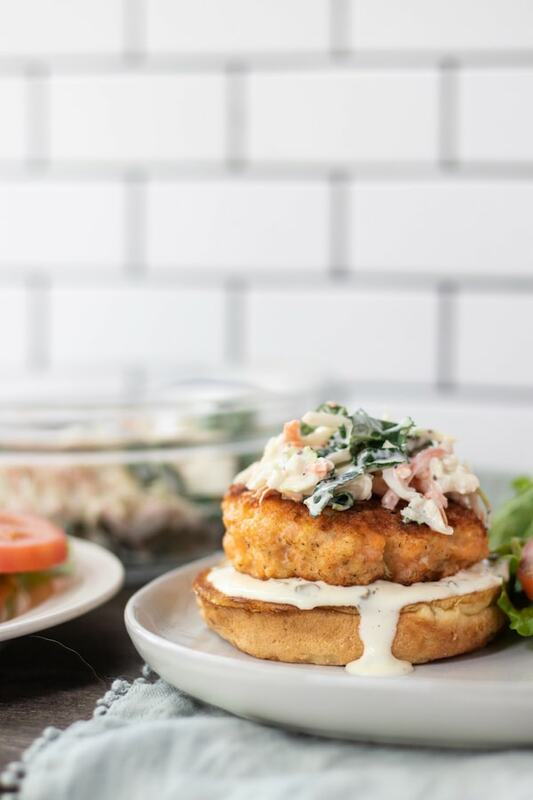 Assemble salmon burgers by smearing aioli on bottom bun, add salmon burger and top with kale slaw. Garnish with tomato and leaf lettuce as desired. Option to toast brioche bun on stovetop, lightly with small amount of butter. Option to bake salmon burgers without pan-searing them before. You can do this, but I enjoy the nice crispy edge that a pan-sear provides! LOVED this recipe – the coleslaw was perfect and added a nice crunch to the burger. Will definitely be making this again! Thank you so much ! Glad you liked it ! Loved these so much, I ate the leftover burgers for dinner three nights in a row! Easy to prepare, healthy, and delicious. Look no further, this is the only salmon burger recipe you need.